subscribe to the notion that religion and morals are mutually exclusive, but if a common-sense man like Romney can keep his religion separate from his politics, he'll get my vote. The problem with sensible people like George Romney though is that they are often sensible to a fault. Like Henry Ford, I think Romney failed to see that people often want something more than cheap, practical transportation. " He was smart enough that he probably would have adapted, but I don't think you'd have ever seen something like the Mustang originate under a company run by George Romney. 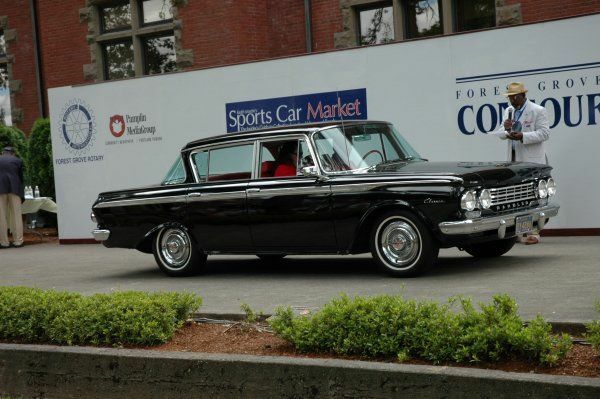 He deserves credit for the '63 Classic and probably the '64 American, which were attractive, competitive and successful vehicles, but a company cannot profit solely on low-priced products. The Rambler Rebel was produced under during his reign. 327 V-8, 4 barrel, solid lifters. I was there. First AMC show for me. I wore the t- shirt for 10 years or so. Stinking hot, even for a PA. boy.